In a bowl, mix together all the ingredients. (I keep back about a quarter of the flaked salmon to stir through after everything is mixed. Season to taste. Chill for at least half an hour, to allow the flavours to mingle. 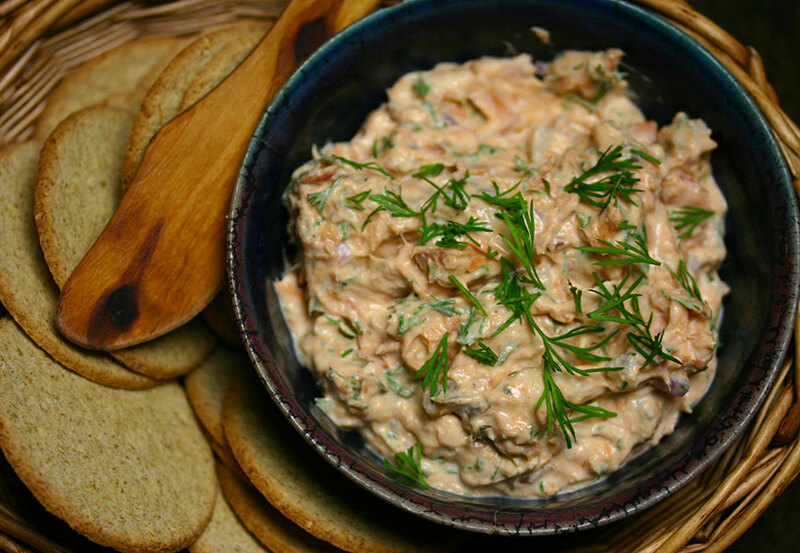 Adjust seasoning, garnish with dill and serve with crackers. The way our tastes are so similar, I’m sure you’d love it! I’ve only had smoked chicken a couple of times and thought it was delicious. One of my favorite uses for smoked salmon. I usually use solely cream cheese, but yogurt does sound like a good idea. I must confess my ignorance as a Canadian – what is “hot” smoked salmon versus the other? There are two ways to smoke salmon: hot smoked and cold smoked. Hot smoked is what we’re used to in Canada. The fish is smoked at 120-180°F, and the end product is firm, flaky and opaque and usually sold in pieces. Cold smoked salmon is smoked at a temperature below 100°F. It is soft, silky and translucent and usually sold in slices. Yum, this dip sounds so delicious!